Life changing bread: The best thing since sliced bread | RTB's Blog on Health & Fitness, Travel, Automotive, DIY, Dating & Relationships, Childcare & Education and much more! My girlfriend recently stumbled across the recipe for ‘life-changing bread’ which has, literally, changed our lives. Okay, if you love your soft white bread then it’s not probably not going to help you. This bread doesn’t really work for sandwiches; it’s too firm. To be honest, it’s consistency is closer to cake – but it’s far more healthy than cake, or even ‘normal’ bread for that matter. The nice thing about this recipe is that it contains no sugar, and no yeast. There’s a theory that many so-called gluten intolerant people may not actually be gluten intolerant as such; the issue is often down to the way ‘modern’ (since mass production techniques discovered in the ’50s) bread is made. Manufacturers discovered that they could produce bread in half the time, which meant massive savings in production costs. The technology was quick to be adopted, and has more or less been the method used by most bread makers for the last 60 years. That is, unless you buy ‘proper’ bread that has been baked for a long enough period for the yeast to be fully processed – or sourdough bread which doesn’t use yeast as such. Modern bread is full of salt, sugar and preservatives too, and is simply no good for you. I read that many people who were supposedly gluten tolerant had been able to eat ‘traditional’ and sourdough bread without any problems. I’ve never thought that I’ve suffered from any gluten/bread intolerance, but when I first found out about this, I realised that I’ve often felt very bloated by bread. It seems that this intolerance to the unprocessed yeast can cause some irritation. I switched to sourdough bread and found this much better. This ‘life-changing bread’ is far better than even that though, and it’s quick and easy to make. The psyllium husks are probably not something you have lying around at home… but are apparently essential to the recipe (I haven’t tried making it without though to be honest); we get these from eBay but I guess you might find in health shops… we certainly haven’t seen any in UK supermarkets. NB: Trying swapping/mixing your almonds with hazelnuts, or cashews, for a sweeter flavour. Tip: use warm water to help melt the honey/coconut butter. Pour the dissolved mixture over the dry ingredients and mix thoroughly. It shouldn’t be too sloppy, nor too stiff. Leave for at least one hour to soak up the liquids. The mixture should now be fairly stiff and sticky. Don’t worry if it’s a little soggy still; you can wait a little longer before baking (and add a little extra oats if it’s still too wet) or just bake for a little longer. If liquid is still visible then that’s too wet; add more oats. Crumple a sheet of baking paper (to make it easier to shape) and line a loaf shaped baking tray. Pack in the ingredients, pushing the mixture down well and into the corners. We fold the baking paper over the top and push down to give it nice square edges. Pop it into a pre-heated oven at around gas 5.5/6 / 160-180C for about 20-30 mins. The top should start becoming firm and a nice yellow brown colour. At this stage, remove the tin from the oven. Put a fresh sheet of baking paper on a baking tray and remove the bread, flipping it upside down onto the new tray. Remove the old baking paper, and put it back in the oven, ‘upside down’, for 30-45 mins, depending on how moist the bread was initially, and how ‘crunchy’ you like your bread. Ideally, it should be a nice brown colour – if it starts going black you’ve probably overdone it! You should be able to ‘tap’ it and it feel firm but not ‘solid’ – hard to explain but after you’ve done it a few times, you know what the right feel is. Let it settle for a bit before eating – if you try and slice it too soon, it will be incredibly crumbly. It normally lasts about a week before going off, although in summer I’ve noticed it sometimes going off a day or two before that. I’d say 8 times out of 10 times it comes out great; occasionally it can be a bit too moist at first (but will dry out with time) or slightly overdone, it which case it won’t last quite as long as it will be pretty dry after 4 or 5 days. You’ll learn the best mix/way of baking for yourself. It’s delicious dipped in a little olive oil with balsamic vinegar! This literally has been ‘life changing’ for us, in the sense that we’re no longer snacking on unhealthy snacks – having a ‘loaf’ (more like a brick!) of this around at all times means we have a tasty and handy snack. 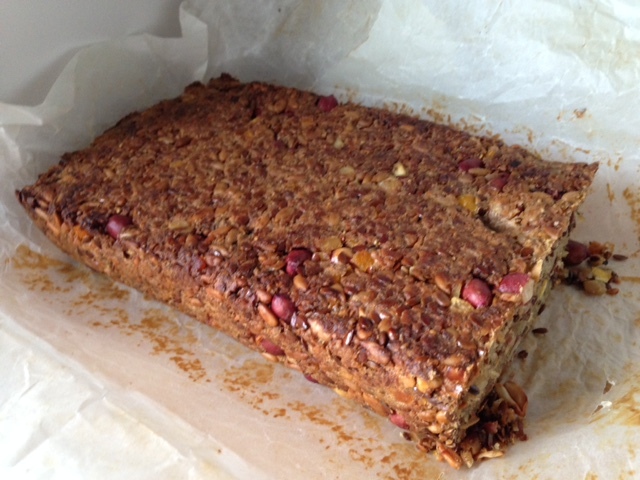 I take a slice or two to work, and have some in the car in case I get peckish on the commute; we often take some when we travel on holidays – or anywhere for that matter – in case we’re hungry enroute. It can also easily be modified… we often add pumpkin seeds or different nuts to subtly change the flavour. We often add rosemary for another lovely taste; I once added black olives and sundried tomato. Adding fruit such as raisins is also an option – but bear in mind these are often high in sugar! Our recent batches have been made with citrus fruit peel added – delicious! My latest attempt added a tablespoon of ginger powder, some chopped crystallized ginger cubes, pumpkin seeds and a smattering of dark chocolate! Not bad, but I’ll add more ginger next time (I can hardly taste it), and this was one of those times when I slightly overcooked it and it’s a bit too dry for my tastes… oh well, can’t win them all! I’m also tempted to try adding banana and dates (or maybe fig)..! NB: This isn’t gluten free... but I believe you can purchase gluten free oats, so you could try making it with those. I’ve noticed some gluten free flours are difficult to get to rise in breads, but this is a different type of bread – there’s no yeast, no baking powder or baking soda – it doesn’t really need to rise as such – so perhaps it will work?